After whats just happened in New Zealand i thought id write about my volunteering experience and encourage other people to do the same. On the 30th of September 2009, there was an earthquake that measured 7.6 to the North West of Padang. 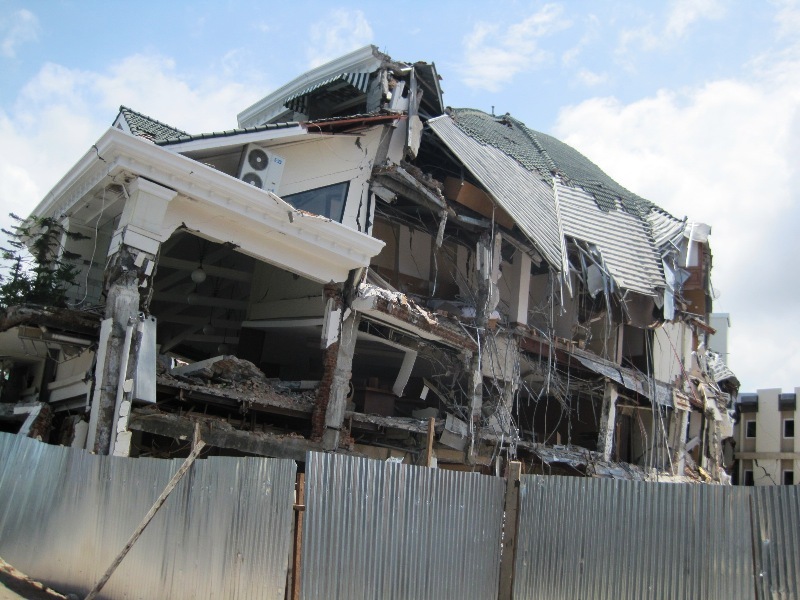 The effect devastated local communities with everything from government buildings through to small houses getting ripped apart. I volunteered with Hands On Disaster Response who have since been renamed All Hands Volunteers. They are a fantastic organization that really promote the truest ideal of volunteering. They are currently working in Haiti and have been there since the major earthquake last year. They offer free food and accommodation to all volunteers and also several internship opportunities to those wishing to pursue disaster relief as a long term career. Accommodation was basic and food was always red, white or orange, but you cant really complain when its free! The devastation was something that is going to haunt me for the rest of my life. We went past houses that were totally flattened and some that were just merely damaged. I was overcome with emotion at the plight of these people, yet they were still smiling... waving... and retorting the usual "HELLO MR!!!!!" Work was hard, every day getting up early and straight onto a truck loaded with tools and other volunteers. The heat was fairly extreme at times but it was the humidity that really brought it home. You could hang something up to dry and unless it was in direct sunlight, it would contain more moisture than when you hung it up! My first job was to clear rubble off a houses foundations so that they had a flat surface on which to rebuild. The family were in good spirits all things considered and provided us with tea, coffee and cake! yum! This first house was not particularly big but the mortar was solid and was difficult to break up. The idea being that you break the mortar away from the bricks in order to salvage and recycle as much of the original materials as possible! Some of the people erected tents inside their houses, despite the fact that whispering would have probably made the entire structure collapse, they clearly had nowhere else to go. The local people were incredibly happy for us to be there and be helping them out with something that they didn’t have the money to accomplish. We were saving on average about 20-25% of the brickwork from a house and then also the majority of the tin and wooden structure from the roof. if you look at that in terms of a house in the uk that costs 400,000 pounds, that’s 100,000 we are saving them on the cost of rebuilding their homes. In terms of Rupiah, we were saving them a few years’ wages. During my time with HODR, my role as a volunteer progressed and my responsibilities expanded. I led various teams on clearing sites and also got involved with deconstruction teams, constructing temporary shelters, I became the tool re-handler and I also got to go and work in an IDP (Internally Displaced Persons) camp which is basically a refugee camp in one’s own country. This was by far one of the most rewarding experiences of the trip. We lived in the IDP camp during our stay there and helped construct a guttering and water collection system to ensure that people were provided with clean water. I also got down and dirty and helped plough, make a machete and got involved with some of the traditional cooking. The people were so friendly towards us and helped us as much as they could. Their hospitality knew no bounds and amounted to more than I could ever express in gratitude. This particular IDP camp consisted entirely of Minang people and is where I learnt the majority of my Minang vocabulary. They were very helpful in learning new words and it seemed to bring great joy to them to hear you use their own language. We finished the water collection system with a minimum amount of problems, although every project has its hiccups. I was at one point pushed aside by a man claiming to be in his 90's and more adept at sawing then I was! He proved very quickly that this was indeed the case. The work part of the trip aside, I really enjoyed the atmosphere. New volunteers would come and go as the months went by and I met a lot of fantastic people that I will hopefully stay in touch with for years to come. The amount of interaction with the locals was fantastic. I regularly used to go and play dominoes with the people who lived next door and developed a taste for Gado-Gado (peanut sauce with noodles) I also learned Indonesia to a standard where a conversation was possible! What a bonus! Overall HODR taught me a lot of things about volunteering that I hadn't really thought about before. This was and still is a totally non-biased organization. They accept anyone from any background and put you to work. Yet they also encourage you to grow as a volunteer. If you think something sounds interesting but you don't know how to do it, someone will show you! When you first arrive, you may have never held a tool in your life, by the end of your stint, you will be adept at plastering, chiseling, shoveling, fixing, labouring, constructing, building, demolishing and you will also be a better person!